The San Romanoway Towers Revival Project is a comprehensive initiative to achieve multiple environmental and social objectives. It takes place in the most populated towers of the Jane and Finch neighbourhood – identified as a Neighbourhood Improvement Area by the City of Toronto. Increasing food security through increased food production in balconies, community gardens and a fruit orchard. Waste management through composting to support urban agriculture and landscaped areas. Water conservation and stormwater management through low impact development, rain water collection and re-use. Strengthening of community cohesion and pride, through involvement in gardening and the arts. This is a high-profile pilot project that will serve as an urban renewal precedent for the hundreds of apartment complexes built in the Toronto Region in the 1960s and 1970s. The project is a collaborative effort, and we thank all of our wonderful partners, residents, participants, sponsors and funders in making this inspiring project a success. 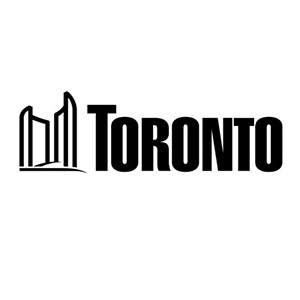 It is being implemented in collaboration with the City of Toronto’s Tower Renewal Project, Property Owners, the San Romanoway Revitalization Association, FoodShare and Orchard People. It is being funded by the Weston Family Parks Challenge, METCALF Foundation, Toronto Hydro and Boise Project Up. 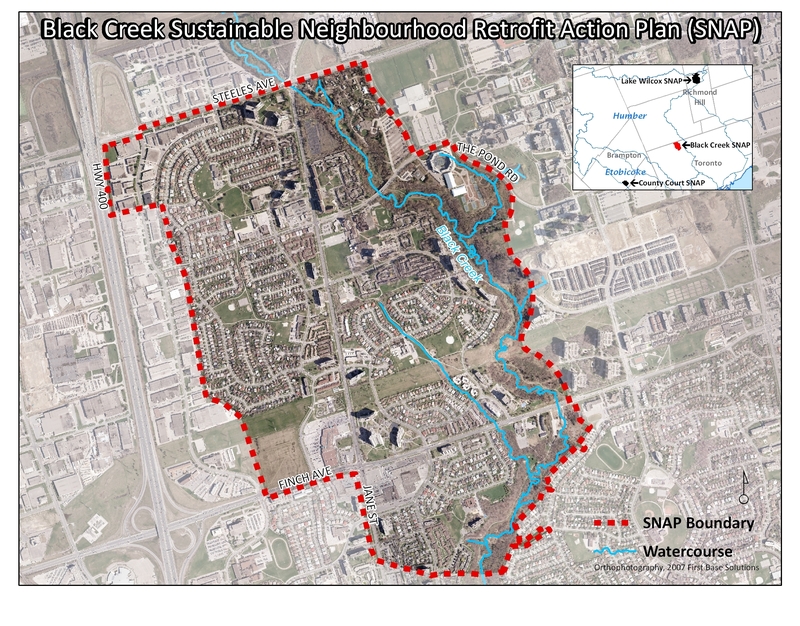 In 2014, Toronto and Region Conservation Authority (TRCA) launched an international design competition called Greening the Grounds @ Jane + Finch, seeking a visionary master plan with additional conceptual designs for designated components of the project. The competition was open to any professional, student, or group of designers. The competition was staged online. Members of the general public were encouraged to review, share, comment and ultimately choose their favourite proposal. The top-voted entries formed the basis of the short list, from which a jury chose the winning design. That design was later adapted to specific site conditions by TRCA’s in-house landscape architects. 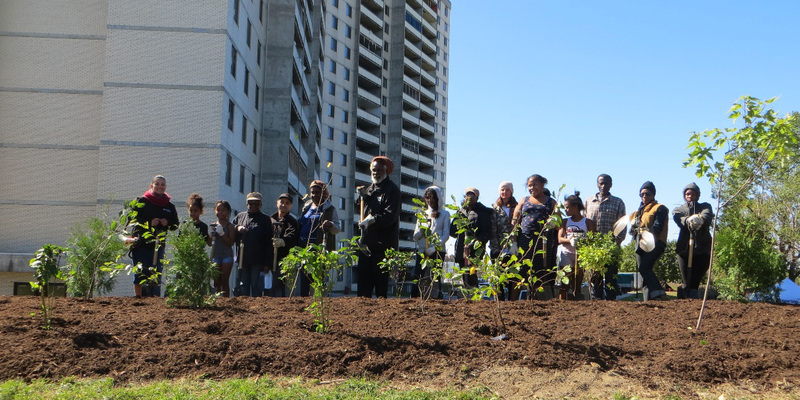 In partnership with Foodshare Toronto, in 2015 a 63-plot vegetable allotment garden was installed and plots were distributed to residents of the San Romanoway towers. All the plots “sold out” at the grand opening of the garden! The garden includes accessible beds for individuals with disabilities, a children’s garden which is maintained by an after-school program with help from other plot-holders, a storage shed with shared tools, compost bins, and rain barrels for water harvesting and conservation. All gardeners participated in free workshops and employ only organic growing practices in the garden. Participants elected garden leaders to coordinate ongoing activities, and decisions relating to the garden are made through majority voting of all gardeners. 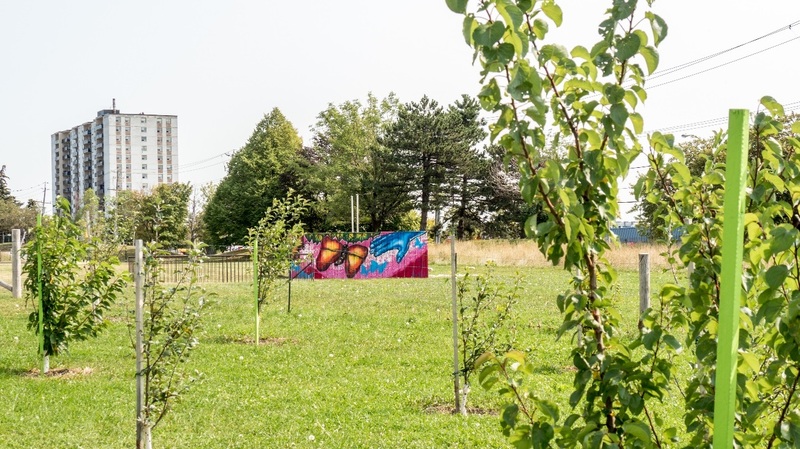 Since 2015, more than 24 trees have been planted creating one of the largest urban orchards in Ontario. Orchard People’s Susan Poizner helped to develop the orchard and train residents in fruit tree care. These participants work together as the stewards of the orchard, self-coordinating watering and maintenance, and sharing their skills with other interested residents. Some of the graduates of Susan’s class have also gone on to offer their fruit tree care services to local residents as a way of generating additional income. 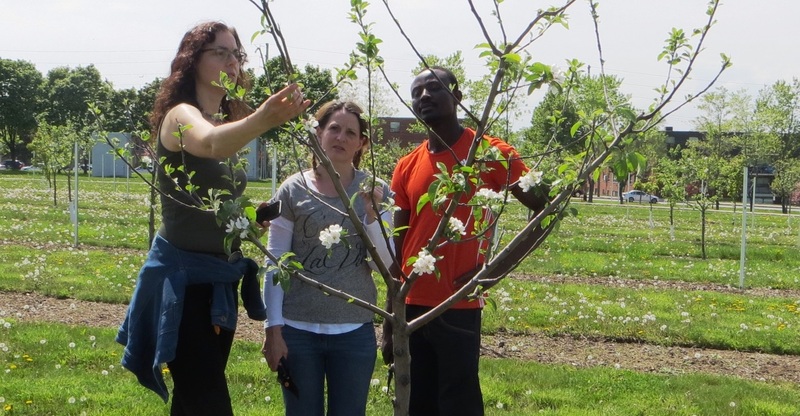 Two graduates have been hired full time to maintain other urban orchards in the city! The pollinator garden and naturalization plantings form an important symbiotic relationship with the orchard and allotment garden at San Romanoway. The pollinator garden attracts important insects to the area that will also provide pollination services for the fruits and vegetables being grown on-site, contributing to increased productivity. Additionally, both gardens provide habitat for birds and other wildlife that eat insects, thus providing an organic form of pest control for all of the gardens. 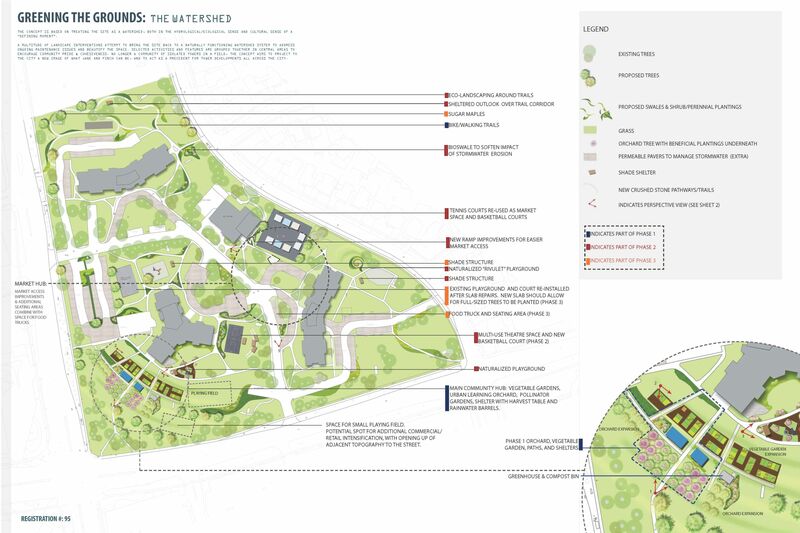 Both areas provide natural beauty to the landscape, encouraging residents to spend time in the outdoor environment and contribute positively to mental and physical health. In the pollinator garden, there are over 750 native perennials and 145 native shrubs that were planted by resident volunteers. These volunteers also received training in natural landscaping and continue to care for the garden. The naturalization site was planted with approximately 400 native trees and shrubs by more than 200 community volunteers. Graduates of the Natural Horticulture Program take care of these sites. 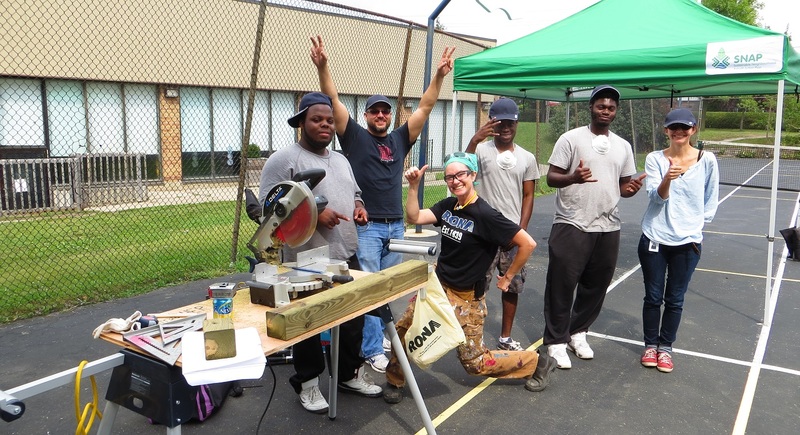 A carpentering workshop provided skills training for local priority youth and resulted in the production of outdoor furniture such as benches, picnic tables and planters for the property. The workshop was led by Anastasia Vaskova of ContractHER.com, a level 2 carpenter with a passion for youth mentorship and green building. The furniture was built using RONA Select Pressure treated lumber (provided by RONA at cost). In 2015 and 2016, more than 25 residents graduated from the beginner fruit tree training course. Participants learned how to properly care for fruit trees including planting, pruning and natural pest control. Graduates of the program volunteer to take care of the orchard at San Romanoway. Graduates can apply to become Orchard Leaders, hired to coordinate volunteers. Through a social enterprise, graduates are also offering their services on fruit tree care to single family homes in the city. 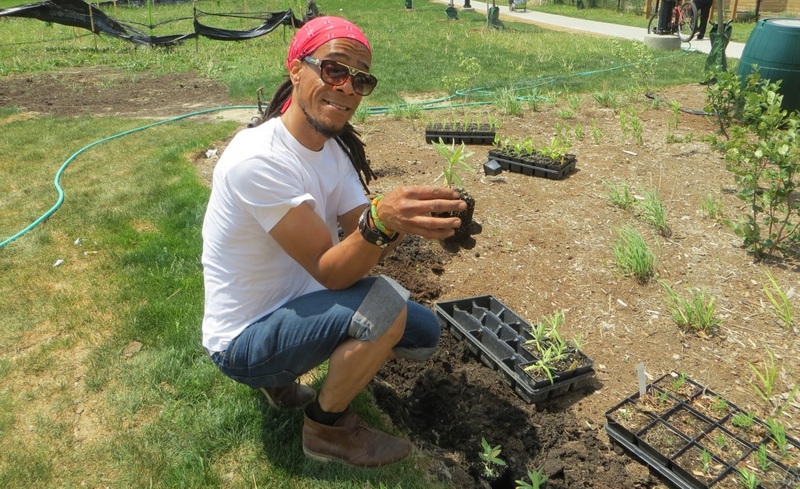 Participants of the Natural Horticulture Program received over 16 hours of hands-on training on how to select, plant and care for native perennials with an emphasis on organic principles. Graduates received a certificate from the City of Toronto and have become paid caretakers of the pollinator garden at San Romanoway. 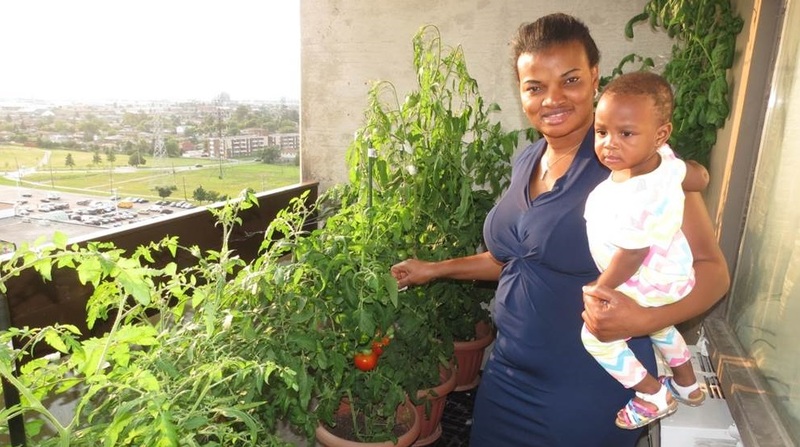 In 2014, the Black Creek SNAP partnered with FoodShare Toronto on a hugely successful pilot balcony container gardening project at San Romanoway in the Black Creek SNAP. Over 54 balconies received 60 containers and produced over 500 pounds of fresh produce with lots of greens, which FoodShare measured as approximately 1,350 servings of locally grown fruit and vegetables. Tenants attended workshops, received the plant and container materials, and measured and recorded their production. Residents with gardening experience applied and were selected to be paid honorariums to act as community project liaisons in the building, helping other participants, answering questions and coordinating events. Building on the success of the project at San Romanoway, the SNAP team expanded the program in 2015 to include another 82 balconies in three other high rise apartment buildings. The project is working with local at-risk young artists from the Palisades Arts Academy and the Spot. 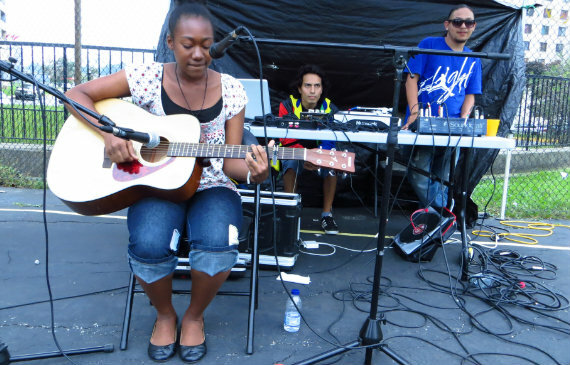 For our public event held in September of 2013, four local artists were hired to play their music, creating a delightful atmosphere, while promoting themselves. These artists have a dream of pursuing a career in the arts. For some of them — such as Aaliyah Ashley, pictured below — our event, which had media attention and more than 400 attendees, was their debut. The SNAP team is working on developing the following programs and fundraising to make them happen! Social enterprise programs to sell locally grown produce, prepared foods and other products in the market offering income opportunities for residents.